Did you know the benefits of preparing for a mock interview with media recording tools? Discover how you can use video to record a mock interview to review the results and polish your delivery. Did you know that what you bring to a job interview can give a boost to your job search? You made it to the interview stage, which shows your resume has done the trick. Please view our article to learn what to take to the interview. Don’t miss this wide variety of tips for how you can prepare the days before the interview, the night before the big day, on the day of the interview, and during the interview! Learn how to give the process your best shot. Let’s have a look at what’s good and bad for interviews. There you have it – the interview dos and don’ts that can keep you on the interview short list. Find out more about how to make a great first impression when you arrive at the interview. Check out what you should do right before the interview and during the interview to make sure your first impression will be impressive! Please see this quick and easy list of tips for dos and don’ts for a job interview. Remember this list for your upcoming interview and see how it smoothes the job hunting path as you learn which actions to take and which to shun. How can you present yourself as the perfect match for the job in an interview? This article suggests: 1. Presenting your competencies, 2. Presenting your motivational level. Learn more! Did you know that Interview Anxiety is like the adrenaline rush athletes get before a match and musicians feel before a performance? Learn how to overcome Interview Anxiety in this article and how to use it to your advantage. Get your great information here about how to handle your first interview experience. Topics include tips on what to do during the interview and what to learn from the interview for the next time. Get ready for being asked personal questions during an interview without fumbling! Please review this article to eliminate confusion and being caught by surprise when asked such questions. Depending on the job position, the process can be long and complex or simple and quick. However, most job interviews follow a similar template. This article provides tips for the questions asked with suggested answers. Consider that employers combine several types of interview questions to evaluate competencies. This article categorizes 8 job interview types with examples so you know what to expect. Get the 5 Top Tips for a Successful Interview Performance and Things to avoid for having a successful interview. Imagine walking into an interview knowing what the interviewer is going to ask and having practiced the answers. Here’s a good selection of practice questions to prepare for your interview. Did you know that mock interviews help reduce nervousness in a person applying for a job? Also, mock interviews provide feedback for you to enhance your job interview performance. Don’t miss this article! Rather than making your mistakes during your interview, make them during a mock interview, where you can eliminate errors with plenty of practice. We’ll show how. Give your upcoming interview the importance it deserves and take a close look at this article to prepare well. We’ve got great tips and pointers to give you a head start on making the interview into the first step in your new career. Learn to interview for a job and how to avoid surprisingly common mistakes that it seems like people insist on making. Explore our easy tips and see the difference it makes when you sit in the interviewer’s office. Whether heading out to your first job interview or on your hundredth try, it pays to learn as much as you can about attending interviews. 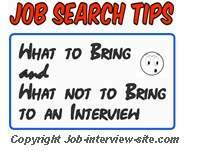 Be sure to check out this article for top tips on attending interviews. What else should you focus on after preparing yourself for every possible interview question? Don’t forget about interview etiquette. Find out correct interview protocol in this article. Investigate this article for interview etiquette tips, ranging from what interview manners you should follow to post-interview actions. And did you know that how you dress also makes a difference? Find out more here! Your body language affects the interviewer’s attitude to you, so learn here what your body language is projecting and what you should do in order to have your body language convey the messages you want. Make sure that the people you provide as your references are prepared for the questions that they may be asked about you. Learn more about which questions are likely to be asked and how you can prep your references.